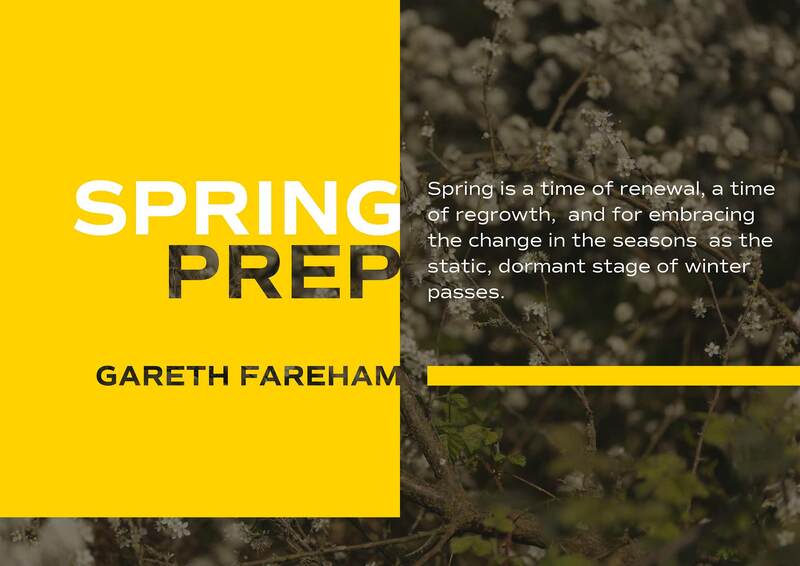 Spring is a time of renewal, a time of regrowth, and for embracing the change in the seasons as the static, dormant stage of winter passes. 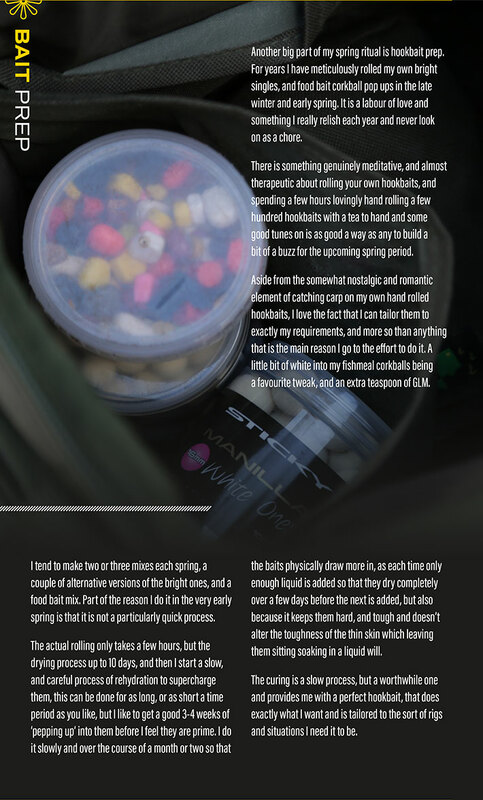 With that renewal of life, comes a resurgence of energy for my carp angling and the psychological need for a thorough prep of my kit. These days I generally try not to exhaust my buzz by fishing too hard through the winter, instead spending it on the rivers, recharging by targeting other species, and saving my energy for the carp from early Feb onwards. I haven’t always found angling hard through the dark, cold months to be that worthwhile, sitting it out for a mid-winter whacker is a mega tough prospect on almost all the big fish waters these days, and whilst I could maybe sustain myself through heading somewhere for a few easier bites, I would much rather trot a stick float down the Stour on a January day these days and I find it genuinely benefits my carp angling in the long run; it keeps the buzz alive through not burning myself out with endless blanks and dark nights, and means that when I do come back to the carp angling after a winter of rest and having had another focus for a while, it seems to make me sharper and all the more keen. Winter is a great time for plenty of pub socials as well, talking it all up and discussing plans over a pint or three – there’s no time for that in Spring. 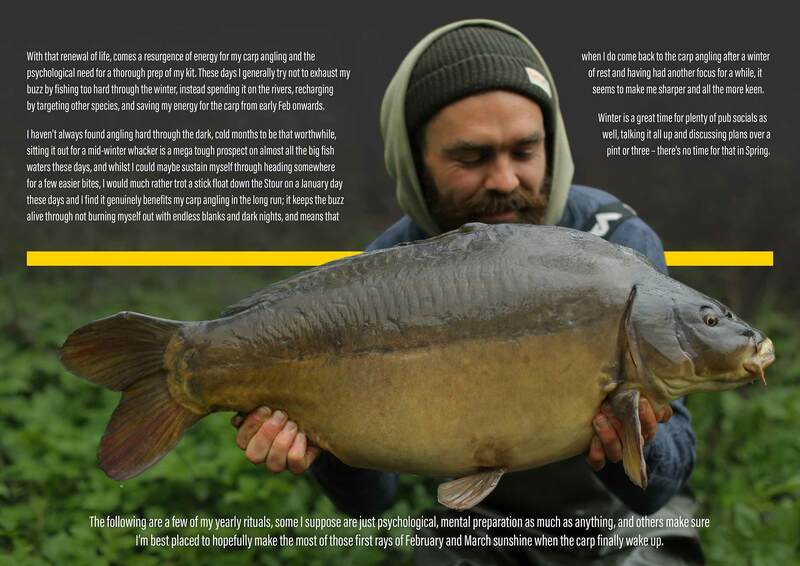 The following are a few of my yearly rituals, some I suppose are just psychological, mental preparation as much as anything, and others make sure I’m best placed to hopefully make the most of those first rays of February and March sunshine when the carp finally wake up. Spring isn’t usually a time for sitting behind big beds of bait in single spots, or putting all your eggs in one basket, at least that’s not what I’ve found over the years anyway. 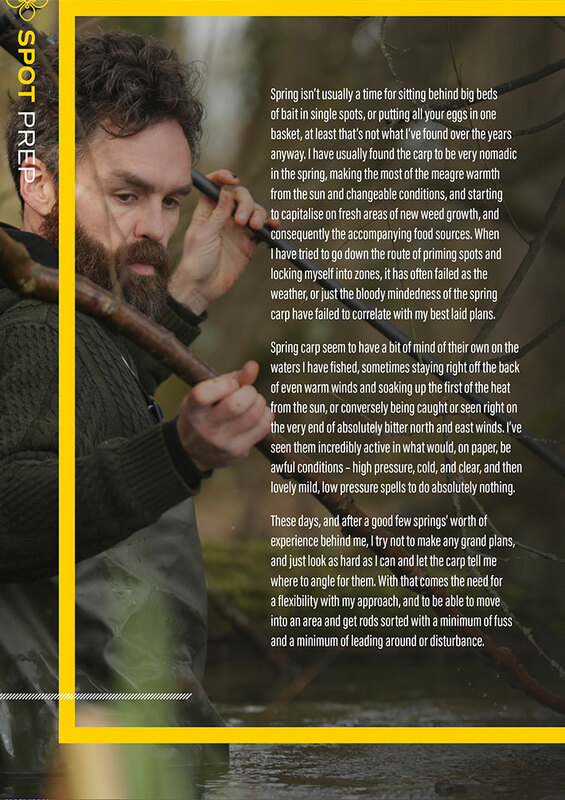 I have usually found the carp to be very nomadic in the spring, making the most of the meagre warmth from the sun and changeable conditions, and starting to capitalise on fresh areas of new weed growth, and consequently the accompanying food sources. 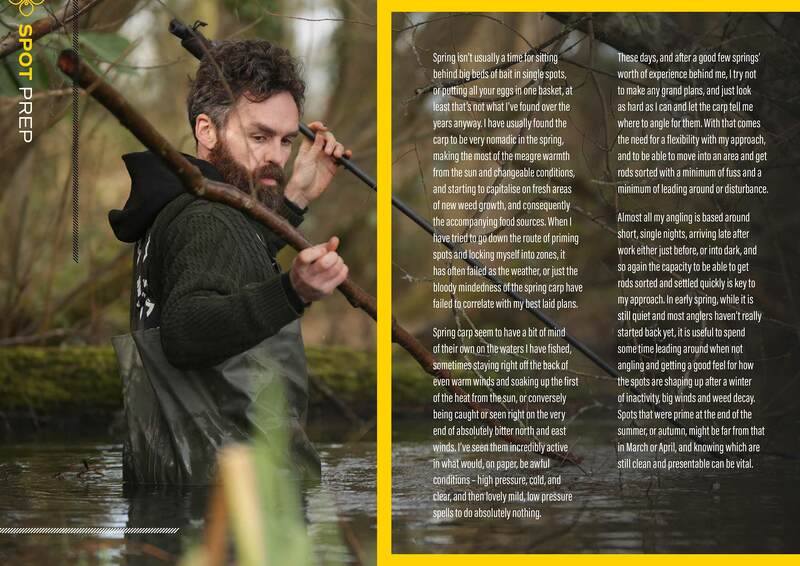 When I have tried to go down the route of priming spots and locking myself into zones, it has often failed as the weather, or just the bloody mindedness of the spring carp have failed to correlate with my best laid plans. 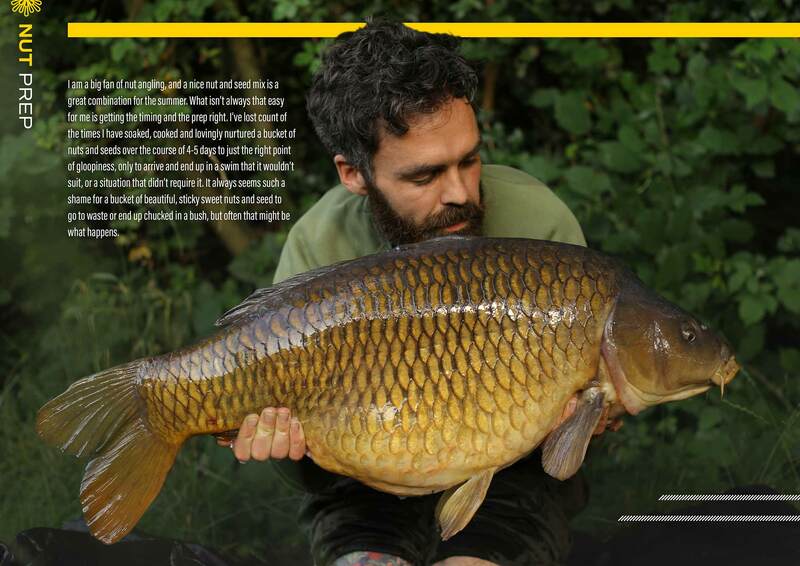 Spring carp seem to have a bit of mind of their own on the waters I have fished, sometimes staying right off the back of even warm winds and soaking up the first of the heat from the sun, or conversely being caught or seen right on the very end of absolutely bitter north and east winds. I’ve seen them incredibly active in what would, on paper, be awful conditions – high pressure, cold, and clear, and then lovely mild, low pressure spells to do absolutely nothing. These days, and after a good few springs’ worth of experience behind me, I try not to make any grand plans, and just look as hard as I can and let the carp tell me where to angle for them. 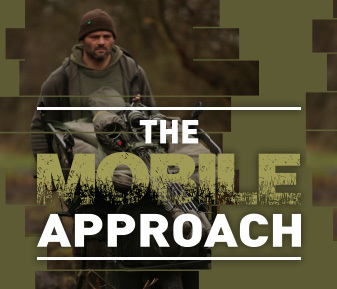 With that comes the need for a flexibility with my approach, and to be able to move into an area and get rods sorted with a minimum of fuss and a minimum of leading around or disturbance. 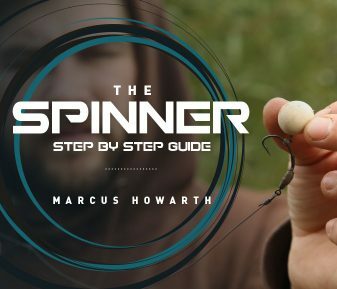 Almost all my angling is based around short, single nights, arriving late after work either just before, or into dark, and so again the capacity to be able to get rods sorted and settled quickly is key to my approach. 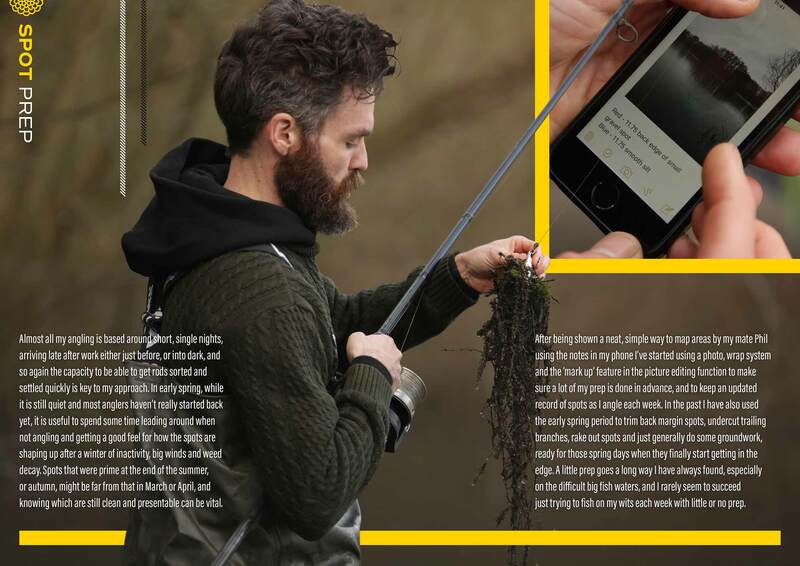 In early spring, while it is still quiet and most anglers haven’t really started back yet, it is useful to spend some time leading around when not angling and getting a good feel for how the spots are shaping up after a winter of inactivity, big winds and weed decay. Spots that were prime at the end of the summer, or autumn, might be far from that in March or April, and knowing which are still clean and presentable can be vital. After being shown a neat, simple way to map areas by my mate Phil using the notes in my phone I’ve started using a photo, wrap system and the ‘mark up’ feature in the picture editing function to make sure a lot of my prep is done in advance, and to keep an updated record of spots as I angle each week. In the past I have also used the early spring period to trim back margin spots, undercut trailing branches, rake out spots and just generally do some groundwork, ready for those spring days when they finally start getting in the edge. 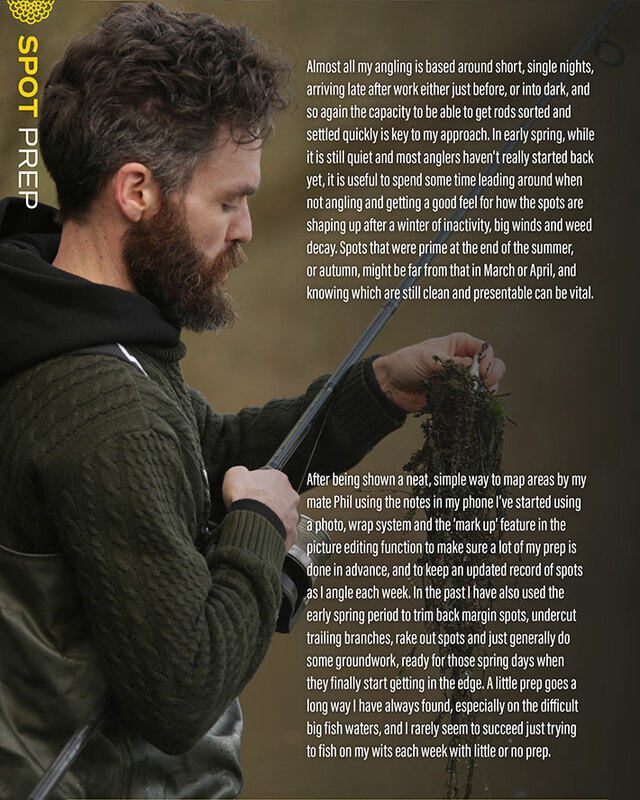 A little prep goes a long way I have always found, especially on the difficult big fish waters, and I rarely seem to succeed just trying to fish on my wits each week with little or no prep. I am a big fan of nut angling, and a nice nut and seed mix is a great combination for the summer. What isn’t always that easy for me is getting the timing and the prep right. I’ve lost count of the times I have soaked, cooked and lovingly nurtured a bucket of nuts and seeds over the course of 4-5 days to just the right point of gloopiness, only to arrive and end up in a swim that it wouldn’t suit, or a situation that didn’t require it. It always seems such a shame for a bucket of beautiful, sticky sweet nuts and seed to go to waste or end up chucked in a bush, but often that might be what happens. My other difficulty is actually working the prep around my job and day to day life as a teacher. Weekdays are really a bit of a write off for getting much angling prep done, and so the only prep I do manage is usually some marking, planning or creating some lesson resources, so finding the time to cook up buckets of hemp and nuts is not always viable. My answer for years now has been to batch cook a few big buckets of whatever mix I fancy – Meeky and Jamie Walker coined his nut concoction the ‘Mix of Doom’ which has always made me chuckle, mine is based on a similar theme and is a rarely used tactic these days I find; tigers, maples, brazils and peanut is my favourite. Once the batches of the different nuts are cooked, they are then left to ferment for a few days, and religiously checked on, waiting until they are at just the prime point of stickiness, sweetness and viscosity, I then blend them individually as they all require different timing, mix the resulting blend in a big bucket and portion it up into little litre screw top jars and freeze them up. Nothing makes me happier than to have a freezer stacked with these in readiness for the summer, made whenever I can find the time, and then it is just a case of grabbing a jar or two along with my boilie each week from about May onwards; added to a jar of hemp, or just as a few handfuls on an edge spot with a balanced nut over the top is superb and I’ve always felt a massive edge to have at my disposal and with a minimum of fuss week to week. Even if I don’t use all the nut mix itself, it is never wasted as I’ll always steep my boilies in the liquid to supercharge them up with all the lovely juice. Another big part of my spring ritual is hookbait prep. For years I have meticulously rolled my own bright singles, and food bait corkball pop ups in the late winter and early spring. It is a labour of love and something I really relish each year and never look on as a chore. There is something genuinely meditative, and almost therapeutic about rolling your own hookbaits, and spending a few hours lovingly hand rolling a few hundred hookbaits with a tea to hand and some good tunes on is as good a way as any to build a bit of a buzz for the upcoming spring period. 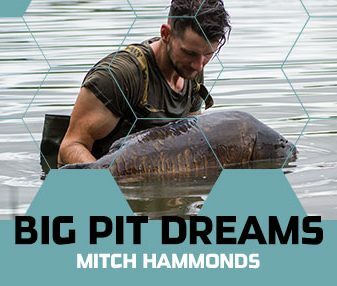 Aside from the somewhat nostalgic and romantic element of catching carp on my own hand rolled hookbaits, I love the fact that I can tailor them to exactly my requirements, and more so than anything that is the main reason I go to the effort to do it. A little bit of white into my fishmeal corkballs being a favourite tweak, and an extra teaspoon of GLM. I tend to make two or three mixes each spring, a couple of alternative versions of the bright ones, and a food bait mix. 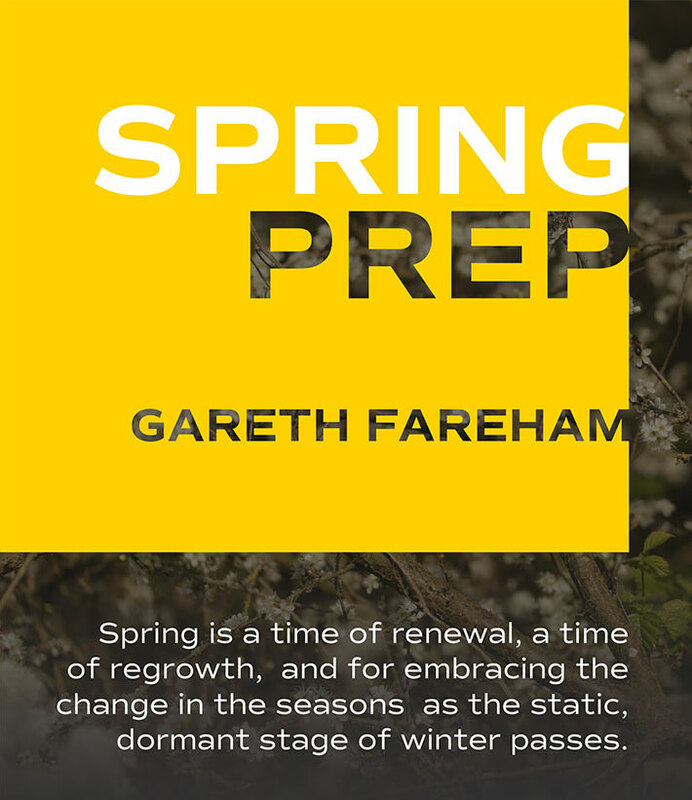 Part of the reason I do it in the very early spring is that it is not a particularly quick process. The actual rolling only takes a few hours, but the drying process up to 10 days, and then I start a slow, and careful process of rehydration to supercharge them, this can be done for as long, or as short a time period as you like, but I like to get a good 3-4 weeks of ‘pepping up’ into them before I feel they are prime. 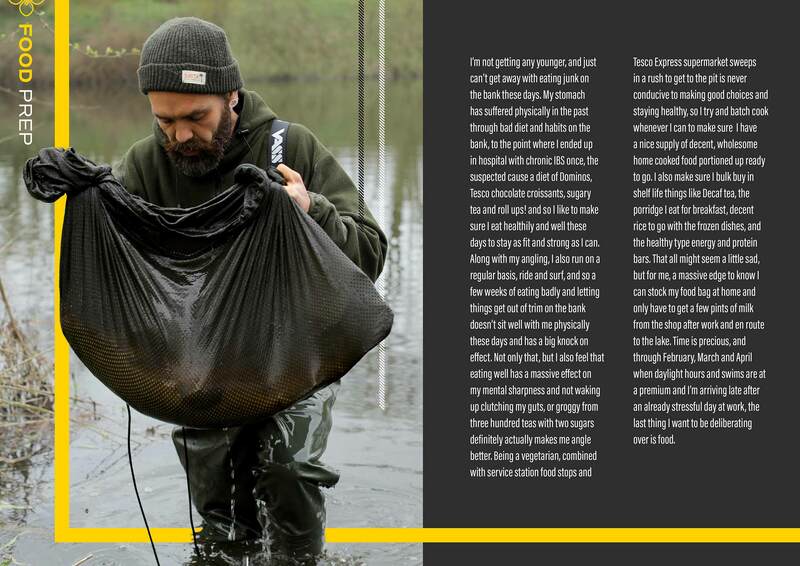 I do it slowly and over the course of a month or two so that the baits physically draw more in, as each time only enough liquid is added so that they dry completely over a few days before the next is added, but also because it keeps them hard, and tough and doesn’t alter the toughness of the thin skin which leaving them sitting soaking in a liquid will. 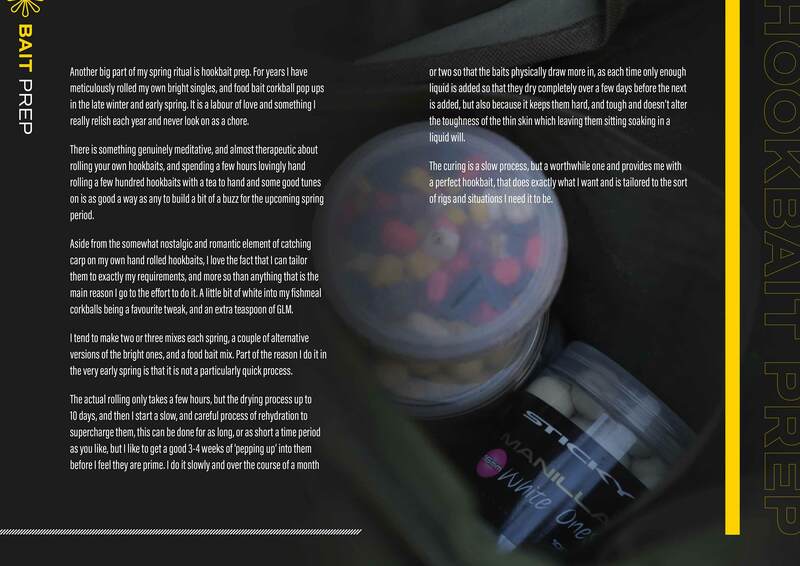 The curing is a slow process, but a worthwhile one and provides me with a perfect hookbait, that does exactly what I want and is tailored to the sort of rigs and situations I need it to be. Once the season is underway, my week to week routine leaves virtually no spare time for any kind of sorting of kit, so if it doesn’t get done in the early spring before I start, chances are it won’t get done until it either breaks, or gives up on me. 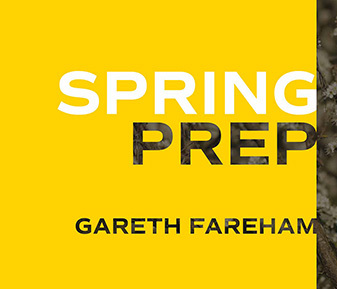 I will always start with the most basic of prep – a fresh line change. Along with having a few pots of corkballs charging up, there is nothing more satisfying than having a few sets of freshly spooled up reels ready to go. These days I try and keep a set of braid spools, and a set of mono spools ready to go at any time and after a hard autumn of abuse and being hauled through weed beds, it is always in need of a change. I take my time, do it slowly, and carefully and then feel smug and satisfied once I can sit back and look at those six spools of lovingly oscillated rope. 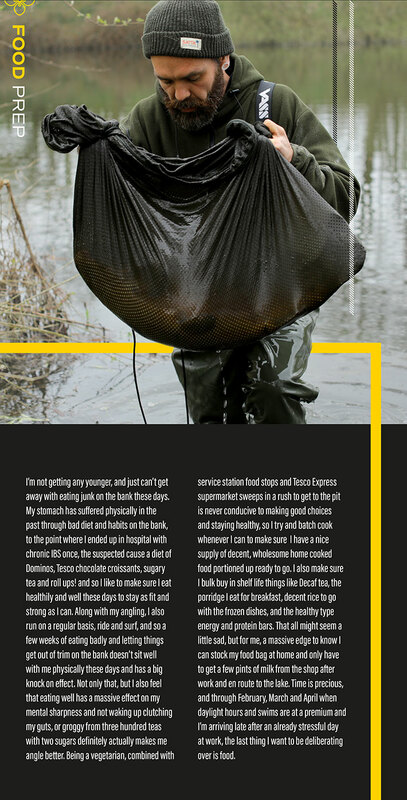 Along with my line, I’ll always give my rig wallet and rucker and food bags a spring clean too – dredging out the old rigs, dirt, leaves and accumulated crap that has built up over the course of the previous year. It is definitely a job Marcus (Howarth) should do as well, as his kit is usually in the sorriest state imaginable, but then again he catches stacks of whackers each year and it does him no harm whatsoever for his rig wallet and food bag to look more like mouse eaten dustbins! I guess some of these things are undoubtedly more just for my own peace of mind and sanity than anything – I just like to be neat and organised, and find it makes my life easier. 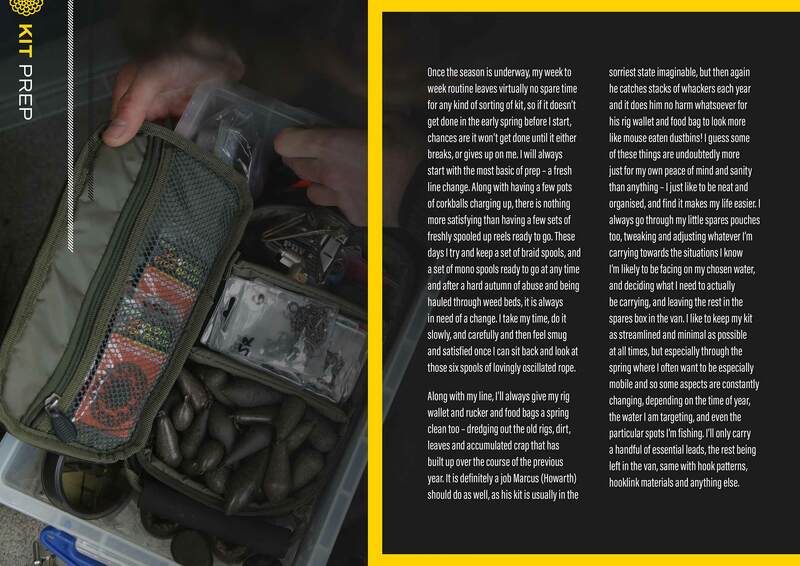 I always go through my little spares pouches too, tweaking and adjusting whatever I’m carrying towards the situations I know I’m likely to be facing on my chosen water, and deciding what I need to actually be carrying, and leaving the rest in the spares box in the van. 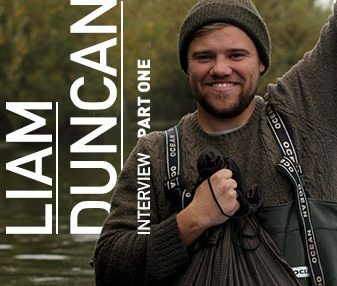 I like to keep my kit as streamlined and minimal as possible at all times, but especially through the spring where I often want to be especially mobile and so some aspects are constantly changing, depending on the time of year, the water I am targeting, and even the particular spots I’m fishing. I’ll only carry a handful of essential leads, the rest being left in the van, same with hook patterns, hooklink materials and anything else. I’m not getting any younger, and just can’t get away with eating junk on the bank these days. My stomach has suffered physically in the past through bad diet and habits on the bank, to the point where I ended up in hospital with chronic IBS once, the suspected cause a diet of Dominos, Tesco chocolate croissants, sugary tea and roll ups! and so I like to make sure I eat healthily and well these days to stay as fit and strong as I can. 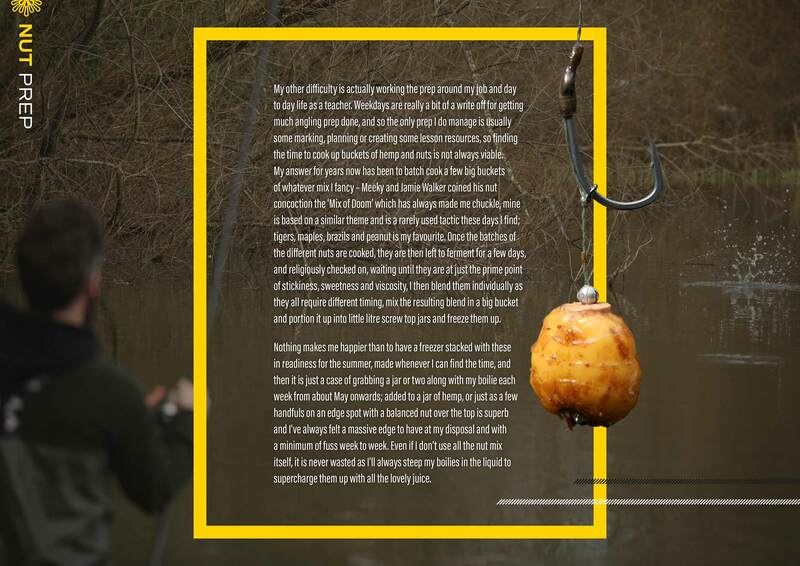 Along with my angling, I also run on a regular basis, ride and surf, and so a few weeks of eating badly and letting things get out of trim on the bank doesn’t sit well with me physically these days and has a big knock on effect. Not only that, but I also feel that eating well has a massive effect on my mental sharpness and not waking up clutching my guts, or groggy from three hundred teas with two sugars definitely actually makes me angle better. Being a vegetarian, combined with service station food stops and Tesco Express supermarket sweeps in a rush to get to the pit is never conducive to making good choices and staying healthy, so I try and batch cook whenever I can to make sure I have a nice supply of decent, wholesome home cooked food portioned up ready to go. I also make sure I bulk buy in shelf life things like Decaf tea, the porridge I eat for breakfast, decent rice to go with the frozen dishes, and the healthy type energy and protein bars. That all might seem a little sad, but for me, a massive edge to know I can stock my food bag at home and only have to get a few pints of milk from the shop after work and en route to the lake. Time is precious, and through February, March and April when daylight hours and swims are at a premium and I’m arriving late after an already stressful day at work, the last thing I want to be deliberating over is food.